« A new amphibian named after Trump! I love razor clams (and I mean in the culinary rather than romantic sense), but these poor guys don’t have a chance against the expertise and fancy equipment of Captain Milt. Here he gets a good haul of Pacific razor clams (Siliqua patula). I once had them stir-fried with black bean sauce in a Vancouver Chinese restaurant, and it was a dish to die for. It looks like he stomps around as a way of detecting the burrow entrances that make a slight depression when the Captain steps on them. I could watch a video like this for hours. This entry was written by whyevolutionistrue and posted on December 19, 2018 at 3:30 pm and filed under food, molluscs. Bookmark the permalink. Follow any comments here with the RSS feed for this post. Both comments and trackbacks are currently closed. That is something I could watch a long time too. Years ago I took part in a student field trip down in Mexico where we used a similar device, made with PVC tubing, to bring up ghost shrimp. When I was a boy we collected razor fish in Britain’s Channel Islands. It was all too easy, a length of clothes hanger wire turned to form a hook at the end, thrust into the tell tale hole and out again with the razor fish clamped around it. What I imagine Ed Ricketts, the prototype for the recurring character “Doc” in John Steinbeck’s novels, spending his days doing. In mid-coast Maine, 80 miles or so northeast of Portland. they run much smaller. But they are tasty in Sashimi. Love razors, but more eating them than digging them. Harder work than it looks in the video. They can move surprisingly fast under the sand, and some clammers swear the clams can “hear” you hunting for them. Of course the clams can ‘hear’ you coming. You’re causing hydrostatic pressure changes in the sand and the clams are buried in it. OK, you got me, the concept of “romantic love” for razor clams made me involuntarily cross my legs and grimace. Clamdigger by Willem De Kooning. 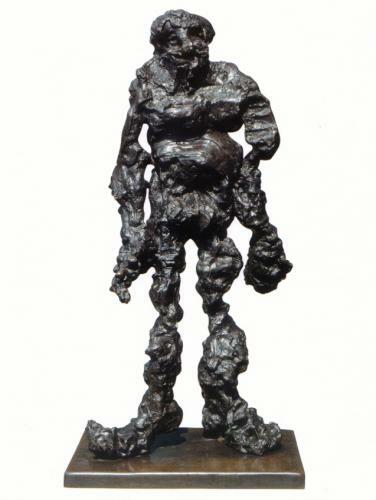 Modelled in clay in 1972 & cast in bronze in 1976. From reading around it seems you don’t have to step on the burrow & the stamping [or hitting the sand with a stick] only acts to speed up the process of detecting a ‘Clam Show’ – when clams move or feed the disturbance in the sand creates a small hole or dimple in the sand. Razor clams can dig downward about a foot every thirty seconds, and they can be anywhere up to three feet deep. They can’t go sideways, but they can move downward fast in wet loose sand. You can see the sand is saturated from the rapid colour changes in the surface as he pushes his coring tube into the sand. Caused by surplus free moisture coming out or disappearing into the sand underneath with the change in pressure. But the effect is visually quite dramatic. I wonder if there are any e.g. birds which hunt by stamping on the sand in a similar way. Razorfish are blind & as you say they can sense movements & pressure changes in the sand around themselves & can disappear deeper into their burrows in a matter of seconds if they are threatened. As youngsters they are free swimming larvae for 3-4 weeks & then they go to the burrow stage & that burrow remains home for the rest of life – which can be 20 years! They filter feed from the burrow until the tide goes out & then they sleep until the tide comes in, thus they are still filter feeding if near the water edge & can be found without the need for stamping. Those predators above are, I suppose, mainly for the larval stage which presumably has a massive casualty rate. I would guess that birds, crabs & bears at the water’s edge will hear the razorfish’s mighty filter siphon, see the holes or smell them out. Couldn’t see any info about how animals hunt them in their burrows stage. “I wonder if there are any e.g. birds which hunt by stamping on the sand in a similar way”. I don’t know the answer to this but the question puts me in mind of the behaviour commonly seen in gulls on grassland where they stamp their feet rapidly up and down against the ground. This is said to mimic the sound of raindrops hitting the surface and to cause earthworms to rise to the surface where the gull can then snaffle them. I don’t know what experimental evidence there is in support of that explanation though. Various species of gulls engage in the behaviour. There’s a minimum stress needed in the sediment-water mixture before it switches from the matrix (water) supported phase to a grain supported phase – which releases the water and creates the spurt of fluid that causes the “clam show”. I doubt that birds have enough weight to trigger that change to any significant range. “Applied mud pies,” as my mud-pie-ology (sedimentology) lecturer used to describe field trips like this. Horizontal snow to be expected. Captain Milt’s Munchkins have a go. Fun. I once had them stir-fried with black bean sauce in a Vancouver Chinese restaurant, and it was a dish to die for. Chinese seafood is always a pleasure. We have it once a year, usually on Grandpa’s birthday. I’m a big fan of stir-fried mantis shrimp myself. trump supporters are not the only ones difficult to get through to. Well, I can see the relevance to slimy invertebrates at home in a swamp, but could you make yourself eat a whole Trump?